Posted April 26th, 2015 by Mike Boyes & filed under General Psychology, Intelligence, Uncategorized, Work Retirement Leisure Patterns. Description: Browse through the linked page showing the “Best of 2014 from Organizational Behavior” and get a feel for the impressive breadth of research that is being done in this growing area of Psychology (think potential career paths!). Links between business and psychology are growing rapidly. Industrial/Organizational or I/O Psychology is the area of Psychology in which we study people in organizational and work-place settings and the Psychology or teams, groups and organizations. 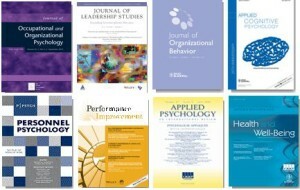 In addition to conducting research in a broad array of business/organizational areas I/O psychologists also consult or work in industry in areas such as team building, personnel selection and retention, organizational dynamics and culture, and a broad array of human resources domains as well. Explore the topic list on the right side of the linked page for a detailed look at the research domains in this part of Psychology. If you are going to major in Psychology but are not yet sure about what part of Psychology will be your main focus you might want to have a look at the I/O psychology offerings at your college or university. Pick one area of I/O or business psychology and describe the sorts of research questions they investigate. What areas of basic Psychology, as covered in your textbook and course(s) do these research areas draw from? What business areas or origination departments might you might you want to investigate or network with if you were an I/O psychologist looking for consulting work? What elective courses would be good to consider taking if you were working towards a degree in I/O Psychology and why? Check out the free article links in the featured web page and if you find one or two that are of particular interest to you use your library’s web links to explore the journals containing those article further. Start with the most recent journal issues and/or the “online first” offerings if they have any and then work back a few years to get a feel for the kind of research being done in the area of Psychology or Business or Business (I/O) Psychology covered by that journal.